7:31am A report of a suspicious phone call received in the 200 block of Woodlawn Ave. was investigated. 9:32am A report of a young child walking on Marion Rd. was investigated. The child was not located. 10:02am A motorist was issued a verbal warning at Plymouth and Earl Streets. 11:12am A vandal report was taken in the 1500 block of N. Sandusky Ave.
12:10am Dustin Cundiff, 25, was arrested on a Crawford County warrant in the 400 block of E. Rensselaer St. He was taken to the Crawford County Justice Center. 1:09pm A false alarm was received from the 800 block of Faustina Ave.
1:20pm Officers assisted Life Support in the 1800 block of E. Mansfield St.
1:26pm A private property accident report was taken in the City Hall parking lot. 2:30pm A report of young children playing in the flood waters at Aumiller Park was investigated. 2:42pm Officers assisted the Bucyrus Fire Dept. in the 200 block of Home Circle Dr.
3:12pm Officers conducted a civil stand by in the 600 block of E. Warren St.
3:27pm A report of a young child left alone in a vehicle in the 100 block of E. Charles St. was investigated. 3:33pm A report of possible drug activity in the 900 block of Marion Rd. was investigated. 3:35pm Officers assisted a motorist locked out of their vehicle at IB Tech. 4:02pm A report of high water on N. Lane St. was investigated. 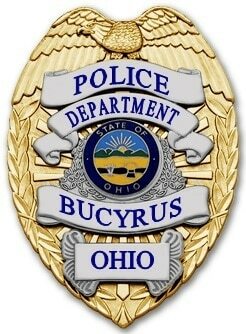 4:30pm Bucyrus PD detectives assisted by Crawford County Special Response Team consisting of METRICH officers, Galion PD, Crawford County Sheriff’s Office and Bucyrus PD served a search warrant at 117 W. Liberty St. One adult male and one adult female were taken into custody with charges pending. Detectives recovered drugs, drug paraphernalia and other evidence of drug trafficking and are continuing their investigation. 4:44pm A report of loud music in the 900 block of Elm St. was investigated. 6:13pm Dimitri Miles, 23, was arrested for domestic violence. He was taken to the Crawford County Justice Center to be held for a court appearance. 7:44pm A resident in the 1000 block of Woodlawn Ave. reported her parked vehicle struck by a bicyclist. 7:44pm A false alarm in the 1400 block of Marion Rd. was investigated. 8:00pm Jonathon Fletcher, 27, was arrested for menacing. He was issued a criminal summons and released with a pending court appearance. 8:15pm A report of children playing in the flood waters at Harmon Field was investigated. 8:31pm A false alarm at the Bucyrus Secondary School was investigated. 8:46pm A report of a reckless juvenile on a bicycle on Washington Square was investigated. 9:38pm A resident in the 500 block of W. Warren St. reported a male looking in her window. Officers checked the area and did not locate anyone. 9:53pm A report of a suspicious vehicle in the 800 block of Prospect St. was investigated. 10:21pm Officers conducted a welfare check in the 400 block of E. Mansfield St.
10:46pm Officers spoke to a female on station about some domestic issues. 10:57pm A false alarm in the 400 block of S. Walnut St. was investigated. 11:27pm An open line 9-1-1 call in the 400 block of Sears St. was investigated. 12:50am A warning ticket was issued in the 100 block of Wayne Ave.
1:33am Officers on patrol checked on a parked vehicle with the dome light on in the area of Fremont St. and Schaber Ave. The vehicle was found to be secure. 3:24am Deondre Adams, 19, was arrested for criminal damaging and criminal trespass. He was issue with a criminal summons for each charge and released with a pending court appearance. 3:27am A report of a suspicious person in the 700 block of W. Perry St. was investigated. 4:47am A report of a suspicious vehicle in the area of S. Sandusky Ave. and Oakwood Ave. was investigated. 5:20am Officers mediated a dispute over property in the 400 block of Myers St. The parties involved were advised it was going to be a civil issue. 6:08am A resident in the 400 block of E. Mansfield St. reported prescription medication stolen.